A new and revised edition of the commonsense guide to real estate riches More and more people are discovering that real estate investing is a safe and affordable way to increase their cash flow and build lasting wealth. If you want to achieve financial freedom, then look no further. 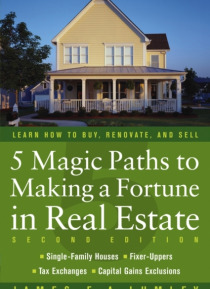 5 Magic Paths to Making a Fortune in Real Estate reveals the proven real estate investment strategies that many of … today's millionaires used to make their fortunes. In fact, you don't even need a lot of money to start investing and start putting cash in your pocket today! Real estate expert James Lumley offers simple, straightforward explanations of the most common and lucrative approaches to property investment--including fixer-uppers, lease/options, wholesales, buy-and-hold, and single-and multifamily rentals. You'll understand all the basics of real estate and learn to use these five strategies to make a killing in any economy. Packed with new information--including sections on the IRS's simplified tax exchange rules and the capital gains exclusion--5 Magic Paths to Making a Fortune in Real Estate will show you how to: * Find foreclosed, repossessed, or condemned properties * Research the markets and perform valuations * Determine what you can safely afford * Negotiate with sellers and buyers * Find the best financing terms, including seller financing * Price and perform money-making repairs * Work with agents and contractors * And much more!